It wasn’t seeing him blown to bits. It was the silence at the end. On Earth, a squad of soldiers led by Lieutenant Scott climb a hillside in a search for a missing science team. Professor Kyle, the lone survivor, accompanies them. The team descends into a cave system to continue the search. During the search, they are stalked by two shadowy figures and communications jamming. In the TARDIS, the Doctor is reading Black Orchid (which has to be more exciting than the actual episode) and consoles a depressed Adric. The boy feels that he is not a valuable member of the team, and he asks to return to his home in E-Space. One might say that some of Adric’s woes are self-induced, but the Doctor avoids that minor detail by proclaiming that he cannot calculate the coordinates. After a heated exchange, Adric begins to make the calculations himself. The Doctor pilots the TARDIS to the cave system so he can take a break from Adric, who in turn has a few choice insults for the Time Lord. The Doctor, Nyssa, and Tegan examine the fossils in the cave walls and wax philosophically about the fate of the dinosaurs. Above ground, the squad’s scanner technician guides the search team to the Doctor’s position. Below ground, the shadowy figures pick off members of the team one by one, reducing them to steaming piles of goo. The figures do not appear on the scanner, probably because they aren’t alive. When the soldiers intercept the Doctor, Nyssa, and Tegan, Lieutenant Scott accuses the Doctor of killing the squad members. After they uncover a metal hatch, the figures attack, and the Doctor identifies them as androids. The professor recognizes them as the beings that killed the science team. One of the androids identifies the Doctor, and its leader, a Cyberman, orders it to destroy everyone. We haven’t seen the Cybermen since the Fourth Doctor and Sarah Jane faced them. This is a way different Cyberman than we’ve seen before. They’re a bit bulkier, have actual moving mouths, and are more verbose, emotional, and evolved. The Doctor deduces that the androids are guarding the hatch, and working with Adric (who has left the TARDIS to look for the other travelers), the soldiers destroy the androids. The Doctor opens the hatch to reveal a bomb, which he disarms after taking everyone to the TARDIS and jamming the countdown signal. Through the remains of the androids, the Cybermen spot the TARDIS and understand who they are facing through a tour of previous encounters. The Doctor pilots the TARDIS to the source of the bomb’s arming transmission, taking the soldiers because the ask to finish the job. En route, Adric and the Doctor make amends, and the boy decides to remain with his friends. The TARDIS arrives on a freighter in space, and the Doctor and Adric take a tour. The freighter is being inspected and replenished, and even though they are due for a bonus after they finish delivery, the crew’s morale is low since several of their number have gone missing. The Doctor deliberately exposes himself to the security cameras, and the Cyber-Leader reveals to the audience that he has agents on the ship. All combined, the travelers are discovered and Captain Briggs sounds the alarm. A crewman named Ringway and two security guards pursue the intruders, but the guards are killed. Their screams draw the Doctor and Adric, who are confronted by Ringway at gunpoint and taken before the captain. The pair is interrogated by Captain Briggs before helping them to trap down a sudden power loss, which is related to the Cyber-Leader and his personal guard taking control of the ship, which is where they’ve been all along. Meanwhile, Lieutenant Scott, Tegan, and the soldiers search for the Doctor. The Cybermen massacre the security teams, and the Doctor finally sees who he’s up against. The situation is exacerbated by Ringway’s revelation that he is working for the Cybermen. Ringway takes the bridge team hostage, but Adric, Briggs, and the Doctor incapacitate the traitor. Adric and the captain conclude that all 15,000 cargo containers likely carry Cybermen, which is bad since the cargo ship is heading for Earth. Meanwhile, the Cybermen use a thermal lance to penetrate the bridge security doors. Just as the door gives way, the Doctor reinforces it with antimatter, and the invading Cyberman is fused with. Lieutenant Scott’s team destroys a Cyberman and critically damages a second. The damaged unit crawls to the Cyber-Leader just as the remaining bridge hatch is blown open. The Doctor meets the Cyber-Leader face to face, and Ringway is executed for not accounting for the soldiers on the TARDIS. The Cyber-Leader activates his army, filling the ship with Cybermen ready to invade Earth. The Cyber-Leader turns the freighter into a missile aimed at Earth, intending to stop an interplanetary conference that plans to unite several civilizations against the Cybermen. Meanwhile, Tegan continues her reign of Ripley-like badassery by stalking through the cargo hold, armed with a Cyberman cannon, but is soon captured and taken to the bridge. The rest of Scott’s team make it back to the TARDIS, disabling a pursuing Cyberman patrol in the console room. Professor Kyle is killed in the crossfire. The Cyber-Leader provokes the Doctor by threatening Tegan’s life to manipulate the Time Lord’s emotions. He leaves two Cybermen on the bridge with the crew and Adric to observe their emotions on impact, and then takes Tegan and the Doctor to the TARDIS to observe the impact from space. Scott and his team leave the TARDIS to search for the missing travelers and end up liberating the bridge. The captain suggests abandoning ship, but Adric sets to work on the unlocking the helm controls. Instead of stopping the ship, he inadvertently pushes it into time-warp. As the freighter barrels back through time, the Cyber-Leader orders the Doctor to land the TARDIS on the ship, but the Doctor cannot do so. The captain orders the bridge crew to abandon the ship, but Adric slips out of the escape pod at the last second and breaks the final encryption code. On the TARDIS, our heroes realize that they’ve traveled back 65 million years and that the freighter is about to be the extinction event that kills the dinosaurs and paves the way for human evolution. As Tegan distracts the Cyber-Leader, the Doctor grinds Adric’s badge for mathematical excellence into the Cyber-Leader’s chest unit. As he dies, the leader fires on the TARDIS control console, but falls to the floor as the Doctor fires the killing shot into the Cyberman’s chest. The damage to the console prevents the Doctor from rescuing Adric, and one critically damaged Cyberman destroys the freighter’s helm console. 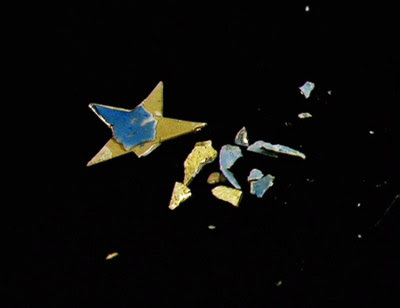 Adric rides the freighter to the surface, ending his journey with the Doctor in a blaze of glory. And even though I didn’t like him much, I shed a tear for his heroic exit. With that powerful ending, it’s actually a little difficult to figure out where to go from here. Overall, I enjoyed this story. It was well-written, even though it was slow in the beginning episode. The characters continue their ascent in the Fifth Doctor’s era, with Tegan stepping up with a touch of recklessness and the Doctor continuing his fatherly approach. Unfortunately, Nyssa was sidelined for a considerable portion of the story. And then there’s Adric. Adric was far less annoying in this story, which is a good way to go out. He had his temper tantrum at the beginning which drove the plot, but he acquiesced and apologized before being the key that literally saved the world. He joins the small list of companions to die while traveling with the Doctor – the other two are Katarina and Sara Kingdom, both from The Daleks’ Master Plan – and his death was just as chilling but, in my opinion, more heroic. His arrogance was his downfall since nothing changed between him leaping out of the elevator and crashing into Earth, but his drive and motivation are something I admired. Even though I knew it was coming – it’s very difficult to avoid spoilers around critical touchstones like this thirty-five years after the fact – the ending was still very emotional. Mind you, it doesn’t erase the problems I had with the character, but it does put a positive cap on his journey and growth. To me this is one of the highlights of the fifth Doctor’s era, and really shows how the series will go now that they have a new script editor (who wrote this one as well) to stabilize things. Saward is much more interested in an Aliensesque approach to futuristic stories. He seems obsessed with mercenaries and loves a future that’s run down and dirty rather than polished and sparkling. Combined with the star power that John-Nathan Turner was able to hire to the series and Davison’s wonderful acting, the ratings and the popularity of the program worldwide actually continued to go up during the fifth Doctor’s era, even if Davison isn’t as fondly remembered as Tom Baker.